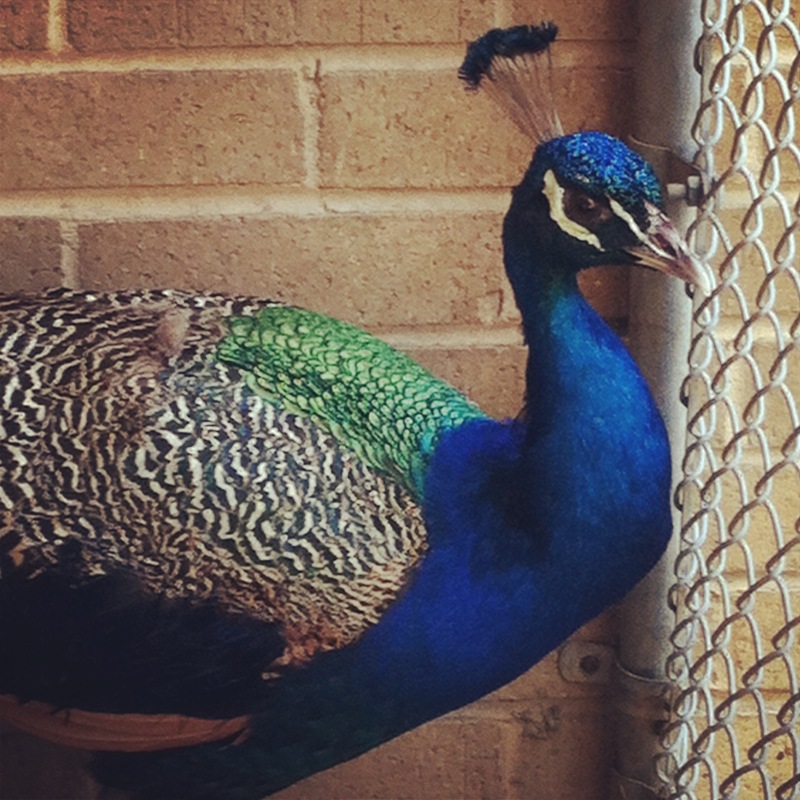 Exotic Birds… in the ‘Burbs? Imagine if you saw this big guy hanging out in your backyard. Yep, that’s what people have been seeing in my area for the last two months. This handsome bird finally came in as a stray after being sited in local neighborhoods. I honestly had never seen one of these beautiful birds up close – he is really stunning! Off to rescue he will go. It sure isn’t every day when you walk into work to see this! This entry was posted in Rescue/Humane Society and tagged animal shelter, exotic bird, homeless birds, peacock, stray peacock. Bookmark the permalink. How awesome! Peacocks are such amazing, beautiful birds. I can’t imagine seeing one walking around the neighborhood though! We have a family on our street that has several peacocks. I remember the first time I was driving by their yard and saw one. They are beautiful. The farm behind us (Reed farm) used to have some. They made a noise like a baby screaming. They can be very loud! We had some near our lake house. 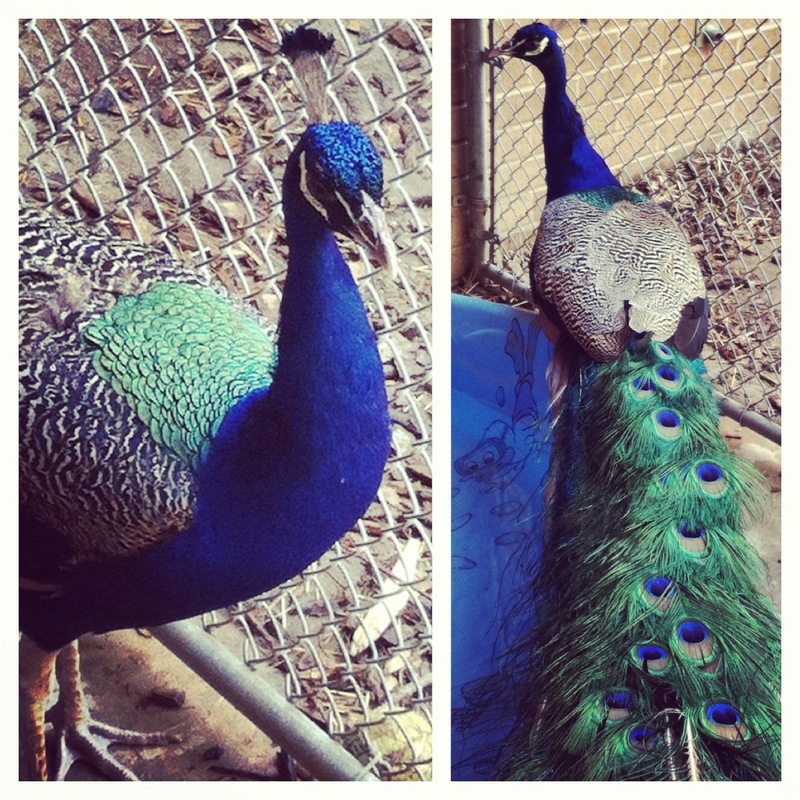 I grew up in a rural area and two of my friends had peacocks that hung out with their chickens!! Wow! We have crazy wild turkey’s up here… but no peacocks! PS. So happy to hear Johnny got her perfect forever home! We’re a bit behind on commenting, but we’ve been reading along! I just spent the weekend in the country and there was a peacock where I stayed. Beautiful and really, really, really loud! I can’t imagine hearing that in the ‘burbs! My great aunt used to have both male and female peacocks, in addition to a bunch of chickens. They can be very loud! I see them every now and then in this one area of my town. I am assuming they are someone’s pets, but it’s weird to see them! Beautiful birds.